One of the classic swing dance looks is a “collegiate look,” a youth culture of the jazz age and swing era (and beyond, really), who had their own trends and fads, like any youth culture – one option to add to this look is a classic letter sweater. Last year All Balboa Weekend had a limited number of ABW patches made up, so of course I snagged one because I love the look, love the concept and I lettered in a couple of sports when I was in high school, so I’m partial to that nostalgia – I mean, of course I’ve lettered in Balboa by now, my 10th ABW, right? But my ABW letter patch has been sitting on the dresser in my guest room since then, waiting for the perfect sweater. 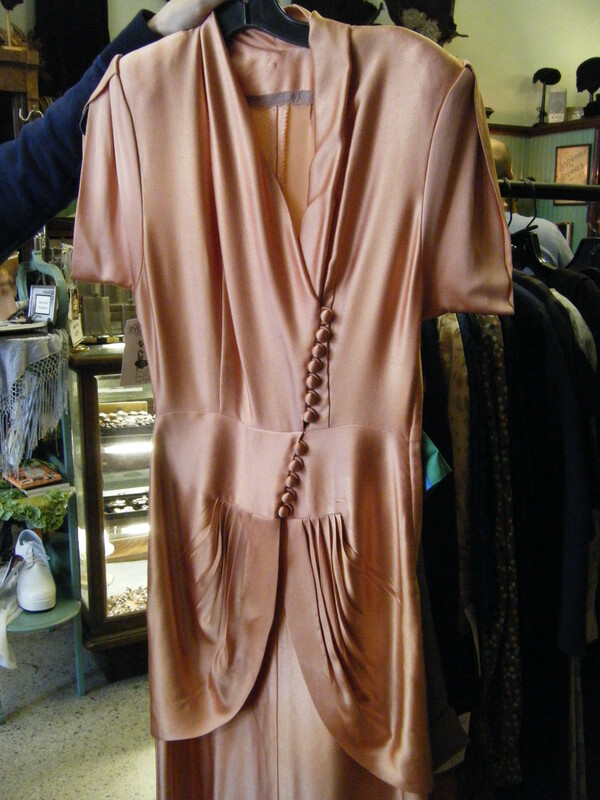 I had hoped to find a vintage one, but finding one in the right color and in my size proved to be a non-starter. I ran into New York dancer/instructor/performer Adrienne Weidert at Camp Hollywood in September sporting a Miss Camp Hollywood letter sweater and she (and several other former Miss Camp Hollywood title holders) had purchased theirs online. It makes sense, I had a letter jacket in high school, those classic items can still be purchased, why not sweaters? Then, dancer/instructor/organizer Andy Nishida tagged me on Instagram for a kelly green 30’s/40’s wool letter sweater being sold by @mrartdeco, and I had to have it – exactly my size, my favorite color, maybe it would look good with the ABW letter, and if it didn’t I’d still have a ton of things to wear with it. It arrived and it is WARM and HEAVY – like I don’t know if I’d need a coat if I had it on, which I think was the point (that you’d want everyone to see your sweater and not cover it up with a coat). There’s no way I could dance in it, so I decided to look for something more…3 seasons than 1 season. But never fear, the green sweater will be out in its own glory, it really needs no embellishment and you will all see me coming a mile away. I had a birthday coupon for J Crew and went to look at their cardigans – I don’t buy a lot of things from J Crew, but their Jackie cardigan is my go-to classic cardigan (good weight cotton, lovely finish, stays nice through washes, nice shape/length, etc.) so I went to check on any new colors they may have for the fall season. As I’m perusing the cardigan page, I notice the Harlow cardigan, which looks like a letter sweater in shape – merino wool, pockets on each side, trimmed in grosgrain ribbon, but it looks like a lighter weight wool. Of course ordering things online is tricky and I was fully prepared for this sweater to be a total failure of modern clothing, like most things from mall retailers are for me these days. It arrived today and it’s perfect – great weight for a little nip in the air, light enough to be a middle layer, I prefer natural fibers for breathability, and just enough space to sew my letter on. I can’t wait to wear it out and about! Thus ends this letter sweater story – if you are on a search for your letter sweater, I hope some of this information will be helpful. Every time I turn around, I hear about a new vintage reproduction company in the UK, which seems to be where I want to spend my dollars-into-pounds lately and the retail climate appears to be thriving for vintage-inspired clothing. 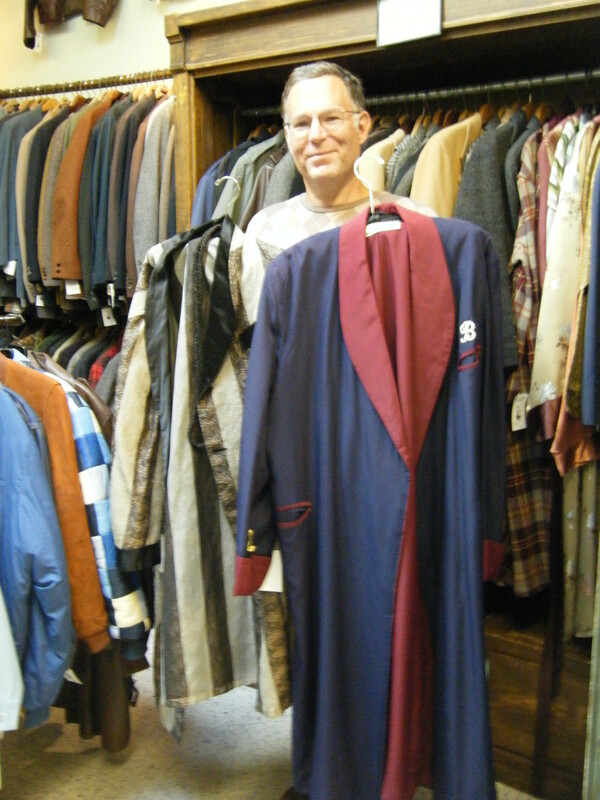 Swing bandleader, guitarist, and dancer Glenn Crytzer tipped me off to Oldfield Clothing, “purveyors of fine British sportswear and accessories for ladies and gentlemen,” when he picked up a pair of their 1930’s workwear trousers, wanting something in a heavier weight for loading band equipment in and out at gigs. The Oldfield Clothing collection looks well-suited to incorporating its pieces into modern wardrobes, with vintage takes on standard clothing items like trousers and sweaters. The trousers really shine – they offer five different cuts, ranging from the most vintage 1920’s golf knickers to the Keaton trousers that look like a standard pair of front pleated trousers (slightly lower rise than their other pairs, but probably higher rise than modern trousers, if you just want to dip your toe into the wading pool of reproduction trousers). There are a range of fabrics, from linen to corduroy and wool, so you can shop and dress seasonally. The workwear trousers Glenn picked are really special, not only for their durable fabric, but also for the details – buttons for braces, button fly, fish tail back, and cinch strap and buckle, to name a few. Women’s offerings are limited to knitwear (specifically – but knickers, see above), but some really good pieces, like solid sweater vests and beautiful Fair Isle vests and a sweater. Other items that could be unisex include caps, leather goods, and a classic cream long sleeve polo shirt with two collar options. I love the chevron/starburst effect of this Donegal tweed herringbone cap. Some of the details on the workwear trousers. I still need this in my life. I’ve been on the hunt for elusive vintage and reproduction knitwear and came across Alixis Lupien on the Oooh La La! Vintage Swap and Sell Facebook group, as she was selling the most adorable sweater with parrots on it. At first glance it looked vintage, but then I looked again and she made it! People who knit clothing are magical unicorns in my book, it looks like so much could go wrong, but here was this darling multi-colored knit sweater that I could see instantly enhancing my summer wardrobe. I followed her progress on Facebook to her Ains & Elke Style Haus Facebook page and then to her Etsy shop, where she posts her incredible novelty knit sweaters and an array of sewn clothing options that you can order custom to your fabric, color, measurement, etc. specifications. Continuing my foray into vintage/reproduction knitwear, I’ll highlight the Wollarium on Etsy, which is both swoon-worthy and holiday wishlist-worthy…and when I say holiday wishlist, I mean that the Wollarium (Emma Sommerfeld in Berlin, Germany) produces hand-made reproduction sweaters from vintage patterns and said hand-made items are priced accordingly. Have you ever knit something yourself? That scarf I made once took forever, I can only imagine the love and craftsmanship that goes into these gorgeous knits. Knit-to-order, so you can have your choice of yarns and colors! 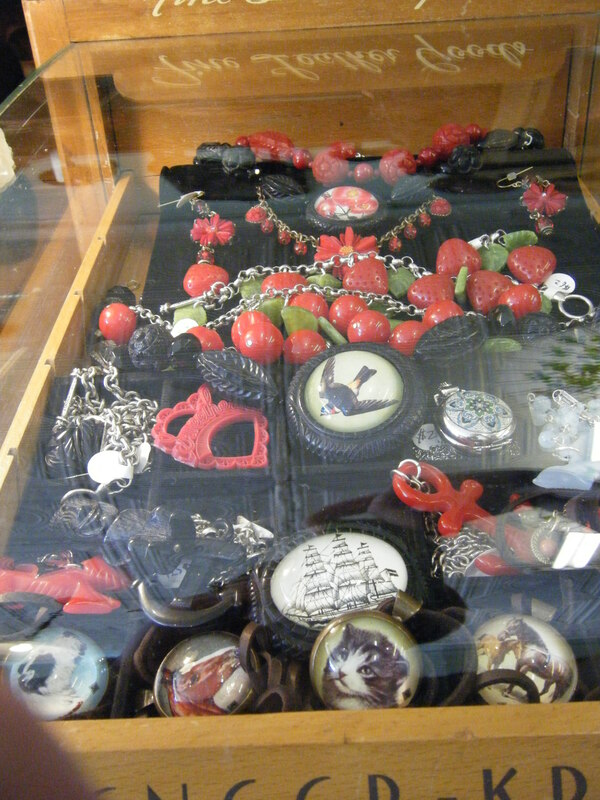 Great items for both ladies and gents. 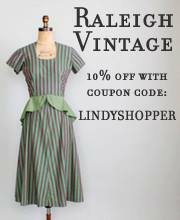 Of course there’s much more than knitwear here, and I’ve seen a few pieces pop up on other vintage/retro retail websites, like ModCloth and Miss L Fire (US shipping!). From blouses to knitwear to gowns to overalls, I love the variety available here – there’s lots of really good everyday basics to work into your wardrobe, casual or dressy, and you could put together an entire ensemble here or just pick up a few special pieces. Also, plaid…keep it coming, I can never get enough! Perhaps the perfect holiday dress? Where was this ivory blouse when I needed it years ago? Classic men’s jeans – high waist, straight leg, cuff or hem. Looks good to me! I’ve been hearing a lot about Freddie’s of Pinewood lately, usually coming up in conversations about vintage or reproduction jeans. This UK-based company has taken a practical approach to dressing vintage, providing reproduction clothing you’d mostly wear just out and about, rather than getting gussied up – lots of great separates, shirts, jackets, and denim. While I generally dislike denim, I understand that most of you live in jeans – perhaps Freddie’s could be a gateway to a more vintage, casual look? There are a lot of versatile pieces on this site, to either dress up or dress down (or both), so take a gander! High waisted denim with buttons down the side, just the way I like ’em! “Saddle” sweater – can I please have one of these in every color? These red denim capri pants are super sassy! I’ve been on the prowl lately for more clothing that can double for work and swing, especially tops. I was delighted to see an email in my inbox this evening from My Baby Jo, a shop I blogged about early on in the history of Lindy Shopper, with some seriously superb reproduction sweater basics for fall. Their “Girl Can’t Help It” sweater looks like a great cropped shell, not too short, but not too long, with a simple weave and colors that are easily embellished with vintage jewelry. Definitely work-safe, and the email also said that matching cardigans would be coming out soon! Available in black, hunter green, lilac, baby blue, and pale topaz. I am always so happy when one of our own embarks on a business venture that is an outgrowth of the love of Lindy Hop and vintage culture. Australian dancer Denise Cox has just launched an online store selling 1930’s, 40’s, and 50’s-inspired clothing called Crimson Gardenia, with distribution in Australia for the moment, and plans of expanding to other corners of the globe and possibly a brick-and-mortar store. I met Denise two years ago at the Balboa Experiment, who traveled with a contingent of well-dressed Aussies, and I have been delighted to follow her process of getting this business off the ground via Facebook. I believe I participated in a survey at some point (market research!) and it is so exciting to see the final product launch! It looks like Denise is off to a fine start, with some great coats, tops, and that awesome Retrolite jewelry from Classic Hardware. Definitely keep your eye on this website – Denise blogs about the creation of her business and an amazing government program that helped her realize her dream on her Crimson Gardenia blog and it’s a great story! I wonder if we have comparable programs like this in the U.S….? My hat’s off to you, Denise, keep me posted on your endeavors! Every once in a while I will come across an eBay seller that I can’t quite figure out – does the seller make the clothes? Hand-knit the sweaters? Is this small batch, but manufactured? How can they sell these garments at such good prices? I came across eBay seller qbiffa’s store when one of their lovely reproduction 1940’s sweaters popped up in one of my searches. I saw that the sweater, which was not in my size, could be ordered in other sizes and, to my delight, there were many other colors and styles of these little short sleeved sweaters available. 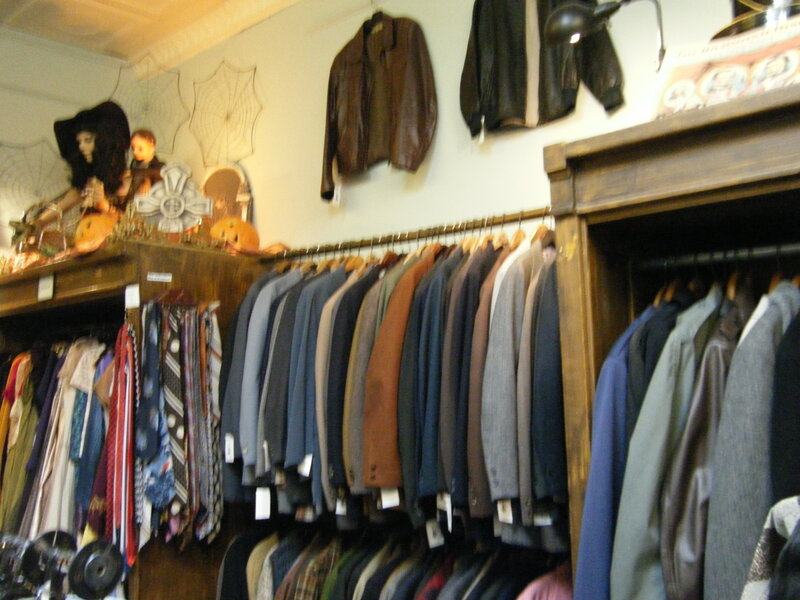 Then I saw wide leg pants for men and women, men’s button down short sleeved shirts, and 40’s repro jackets, with nothing costing over $120.00. Even better, the seller posted a photo of the original pattern for the sweaters and men’s items, so you can see the origin and maybe get some ideas about what to pair each garment with and how it would have been worn. It was another wonderful year at Richmond, Virginia’s Jammin’ on the James, both the dancing and the shopping. Some of my favorite vintage shoppers – Lily Matini, Elizabeth Aldrich, Bill Speidel, and, a new addition to my vintage cavalry, Josephine Stewart – made cameos at the event this year and it made Saturday an exciting and bustling day at the vintage shops in Richmond. 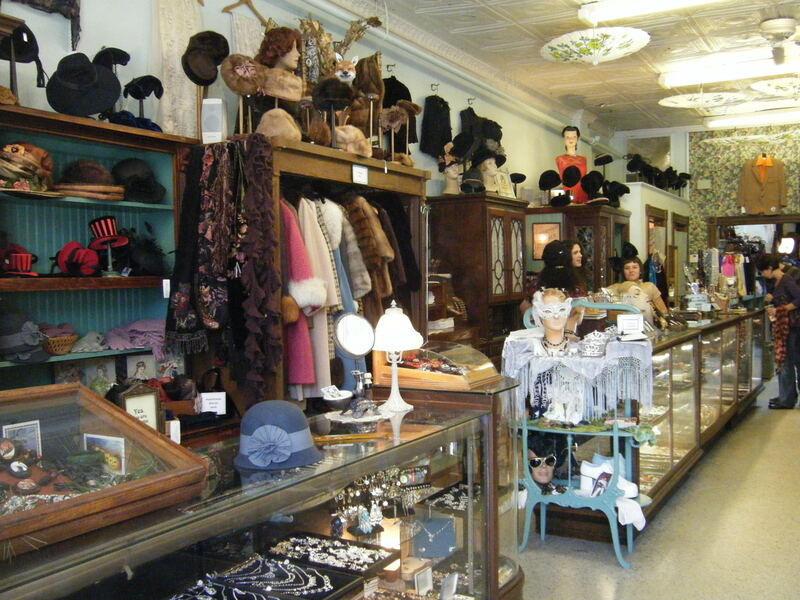 I reported on my trips to Richmond’s two best vintage shops, Halcyon and Bygones, after last year’s Jammin’ on the James, but there’s always new inventory to scout. 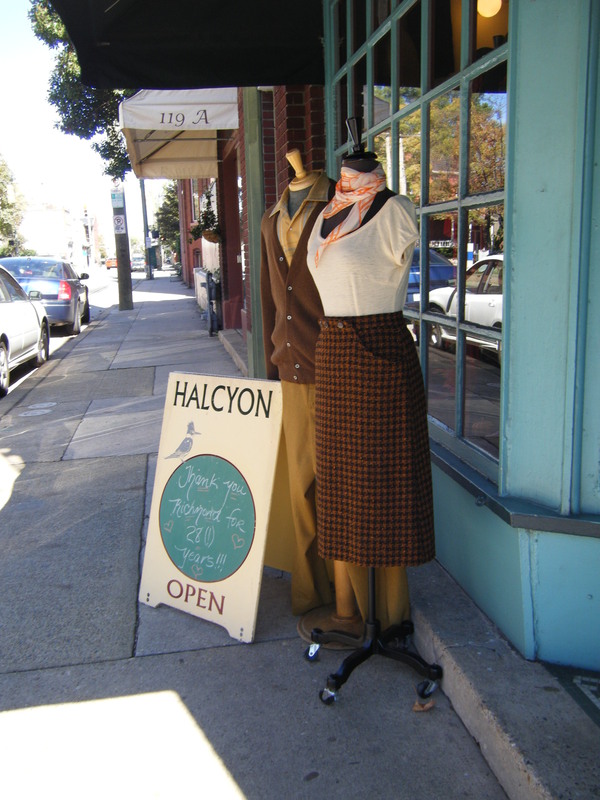 Halcyon is my favorite Richmond store because it is so inviting – beautifully decorated, not too large/too small/too crowded, with a carefully chosen selection of garments that leaves you with the feeling that the entire store is filled with the “good stuff,” no filler. 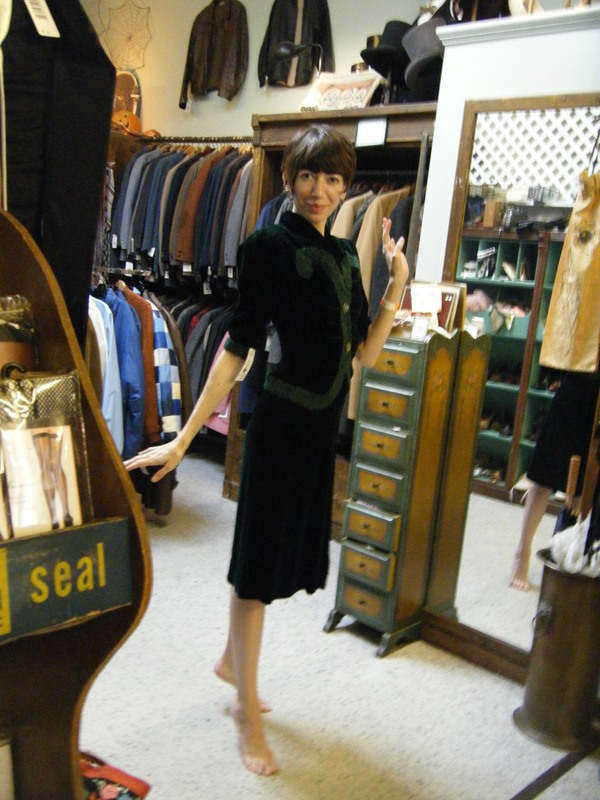 This year was no exception and I left with one beautiful 1930’s dress, but there were several other things I probably could have taken home if the budget had allowed. 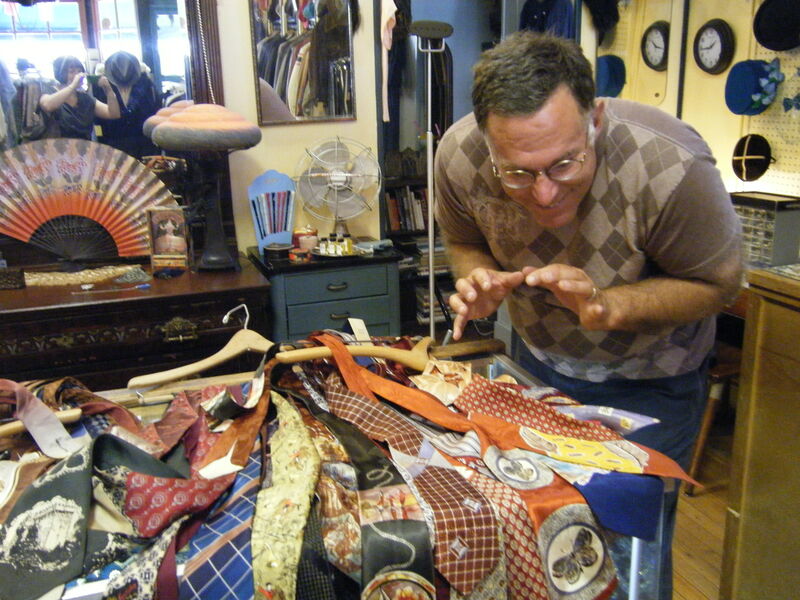 After we expressed interest in ties, Angelica from Halcyon pulled out the hidden rack of beautiful 1930’s ties, including one with circles and butterflies that Bill and I both claimed, but, ultimately, Bill won out because my husband wouldn’t answer his phone to tell me if he would wear the tie. 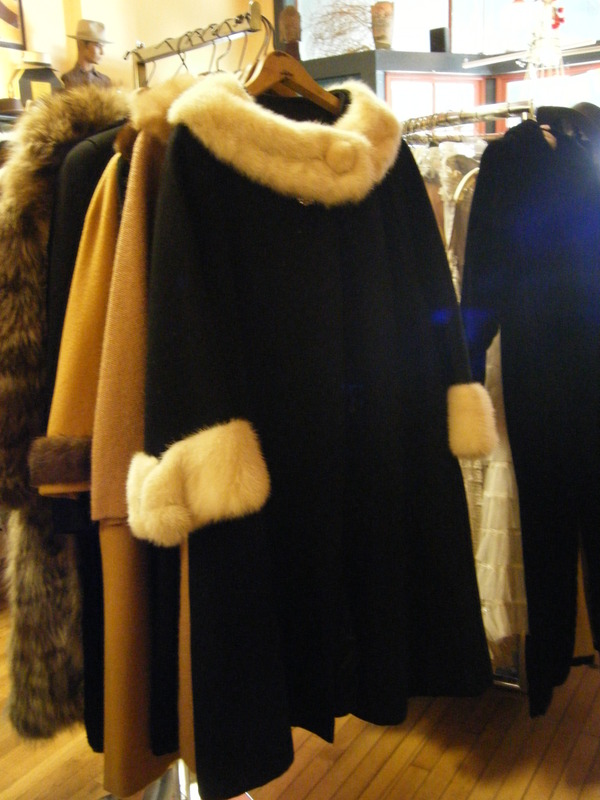 Bill also scored a vintage Alexander Calder inspired tie by Carnival Jones, Elizabeth left with a lovely black faux fur jacket, and I left with a 1930’s silk dress. 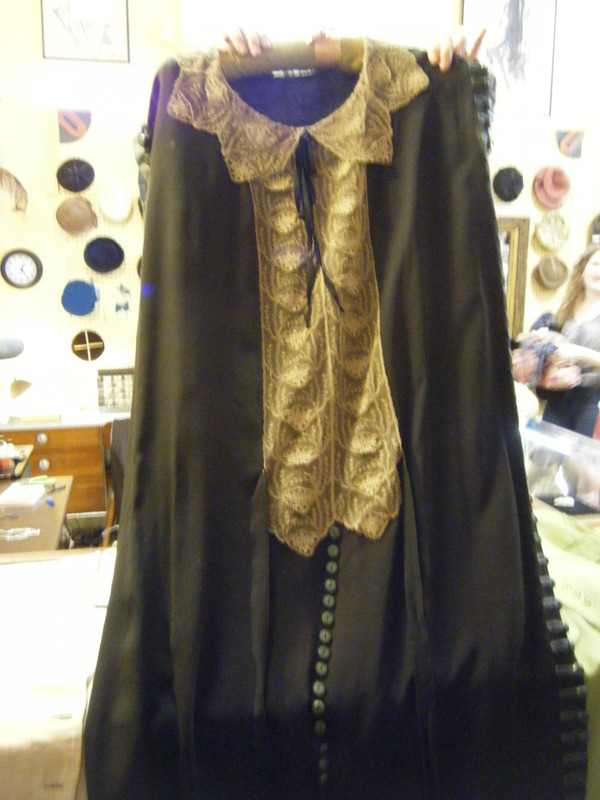 There were some really lovely pieces from a Richmond estate, including a 1920’s dress that must have had over 100 green bakelite buttons down the front and both sides. 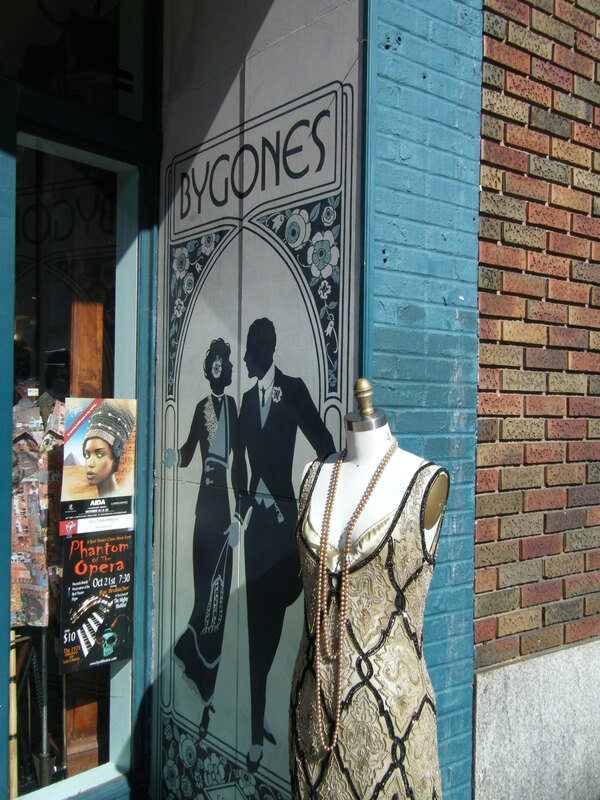 Next stop was Bygones, which is famous for its window display and top of rack displays. This season’s display did not disappoint, with an Egyptian revival-themed window-dressing and an inside display of furs and faux animals that just begged for some taxidermy or, as Bill said, the barrel of a shotgun peeking out from between the furs. Josephine had great luck here, asking for tiny sized clothing and they definitely delivered. 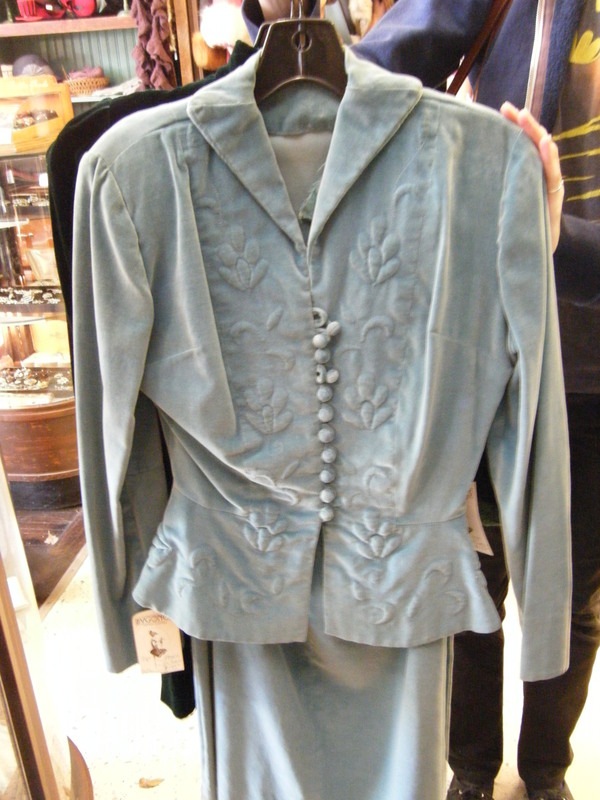 Favorite pieces included two 1940’s suits, one in light aqua velvet with quilting detail on the jacket and another in green silk velvet with amazing trim detail on the jacket. Check out the goods from the photographs below! 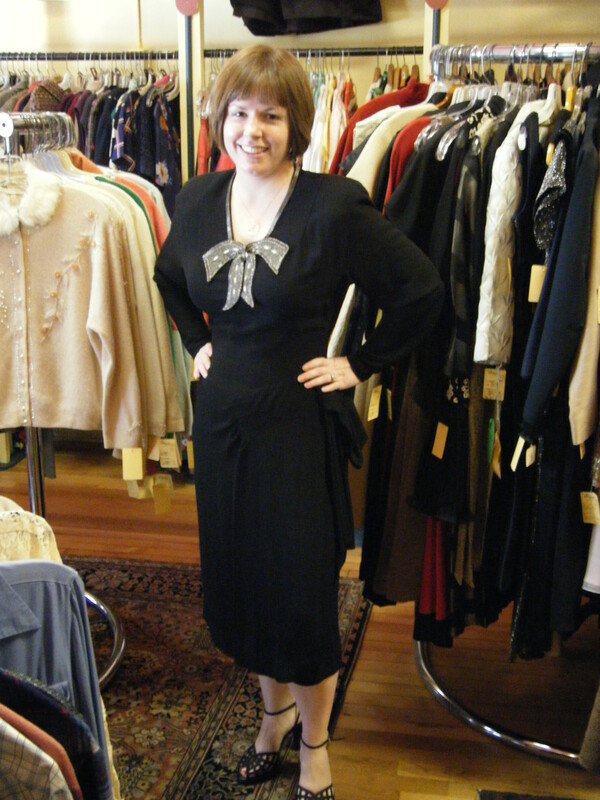 A 1940's dress with shoulder pads fit for a linebacker...still a gorgeous dress! In honor of my trip to visit Knickerrocker this weekend and DJ at his and Bill Speidel‘s monthly dance event, The Southside Stomp, I decided to profile golfknickers.com, purveyors of men’s and women’s short pants, fancy socks and other classic golf attire. Arguably, if these knickers are made for a sport, wouldn’t they also be ideal for dancing? I’d like to think so. There are socks galore, argyle in just about every color combination you can think of. They also have a nice selection of caps, an inordinate amount of argyle sweater vests, and some nice cotton/linen blend regular length trousers in solids and plaids. Having trouble deciding? Golfknickers.com anticipated that the unlimited combinations could be overwhelming, so they have collections of ready to go outfits, that include knickers, shirt, sweater vest, socks and cap already expertly matched – just pick a color. If you’d like to create your own look, but aren’t sure how the pieces will look together, the site offers a virtual model where you can try different color combinations. I love magazines that do the “real” v. “steal” spreads – taking designer and runway ensembles and translating them into more affordable pieces to create the same or a similar looking ensemble. I’ve been wanting to do this on Lindy Shopper, but instead of designer, take looks from iconic Lindy Hop photographs or videos and create an ensemble using modern pieces of clothing. I love doing this for Halloween costumes, but it does take patience to find each piece. So here we go! For the first ensemble in this series, I’m looking to A Day at the Races, the classic Marx Brothers film from 1937 featuring Whitey’s Lindy Hoppers. For the most part, the dancers appear in street clothing, but there are two follows wearing bias cut plaid skirts that really pop on the silver screen, the bold pattern contrasting with the more solid colors on the extras in the background. It’s no secret that I love plaid and this is a great use of plaid to draw attention to these two follows. For the most part, the two outfits are the same: bias cut plaid skirt, white socks, dark shoes, and a collared blouse/sweater. The first plaid skirted follow has a low heeled t-strap shoe and a wing collared short sleeve sweater, while the second has a low heeled oxford and a collared blouse, which may or may not be under some sort of short sleeved sweater. The white socks also help draw attention to the follower’s footwork, especially with the t-straps. I couldn't locate a lace collared shirt, so a plain button-up by American Apparel will have to do. 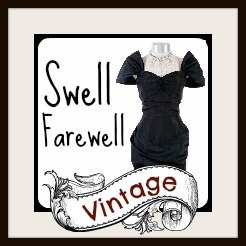 I am very impressed with the selection of clothing that eBay seller Emerald City Vintage has posted, for both men and women. If Emerald City is from Seattle, then it comes as no surprise to me that this seller has excellent threads, as my own excursion to Seattle last year yielded three critical wardrobe items. 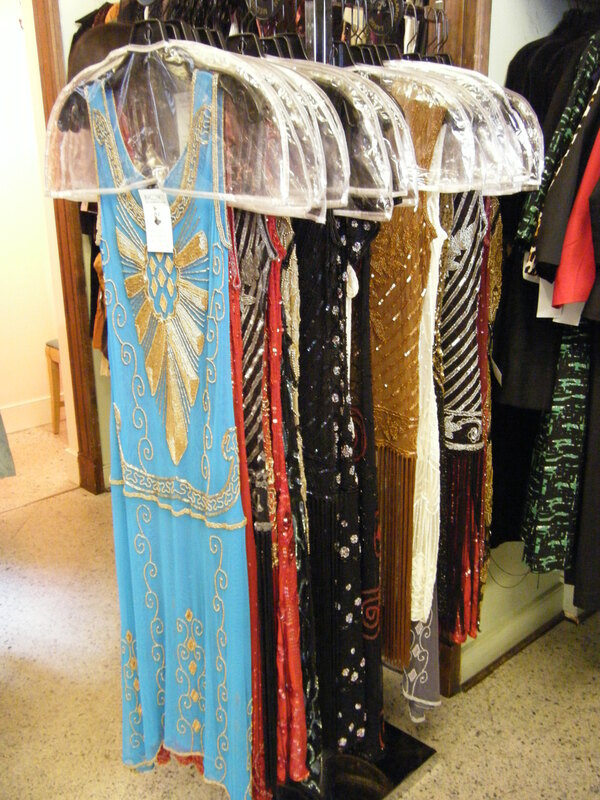 The selection is primarily 1930’s through 1950’s clothing and the starting prices are generally around $20.00. 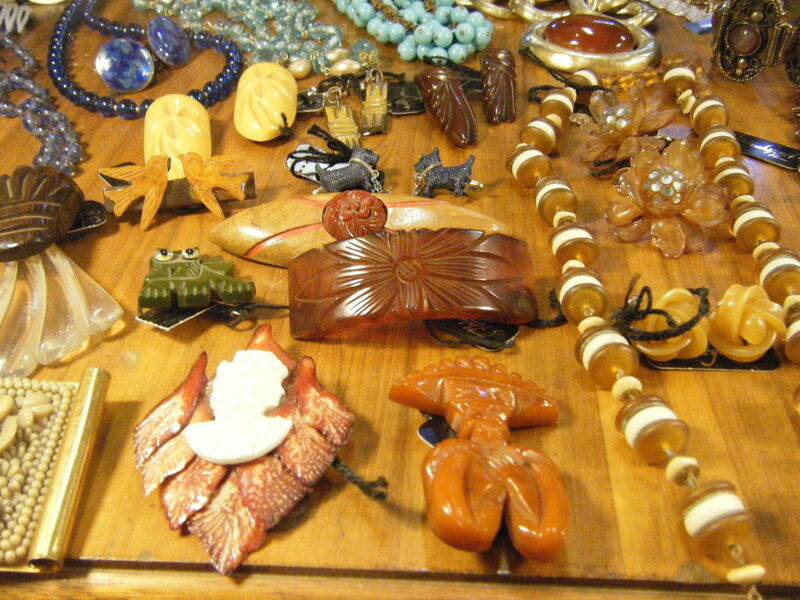 Some of the items for sale are buy it now – whether or not some of these items are reasonable is open to interpretation, but some of the buy it now items are what you would pay in a decent vintage store and others are a bit pricier. Randomly, there are also several dirndls in the store, if you are looking for something befitting Oktoberfest. I first happened upon RetroSpect’d Clothing at All Balboa Weekend 2009, as it was one of the vendors setting up shop outside the ballroom. I heard that a contingency of Australian dancers had come with garments stuffed into each of their suitcases so that the company could sell clothing at ABW. As usual, I was waiting with anticipation as the garments were put onto the racks and quickly made my selections, then headed to the bathroom to try things on. 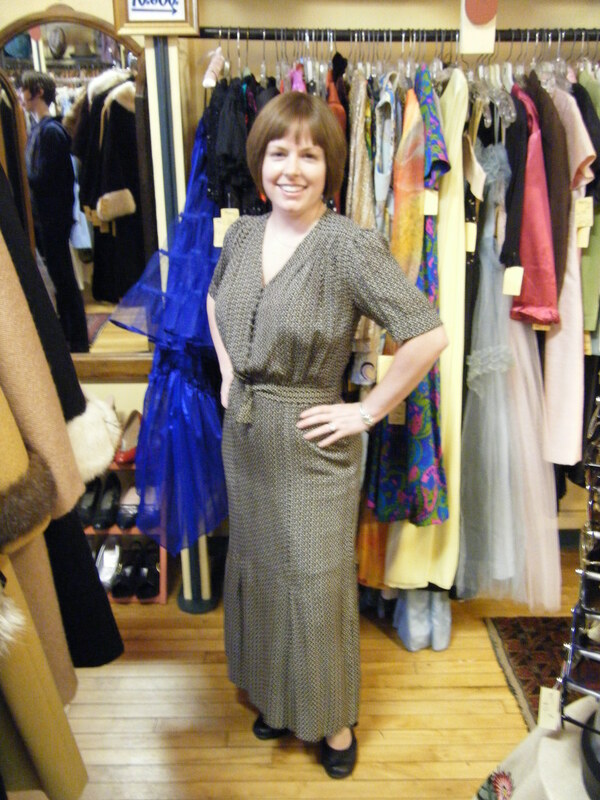 I left the bathroom with one of the most universally flattering dresses I own – Retrospect’d’s 1943 dress in red crepe. Several other girls, of varying sizes and shapes also tried this dress on and it was simply the most flattering dress on everyone, giving the illusion of or accentuating a tiny waist. A flirty skirt, expert fit, cute tucks and gathers, a simplicity of form, crepe material, and sleeves make this dress easy to wear for a variety of occasions year-round. Guys always seem to be looking for pants and Retrospect’d has two pairs of reproduction pants to choose from: the New Yorkers and the Californias. The New Yorkers feature (and pardon my lack of menswear knowledge, Lindy Dandy might correct me later 😉 ) a tab front pant with pleats, cuffs, and buttons for suspenders and comes in 5 classic menswear fabrics. The Californias have a similar wide leg and cuffs, but accommodate a more relaxed, belted look. 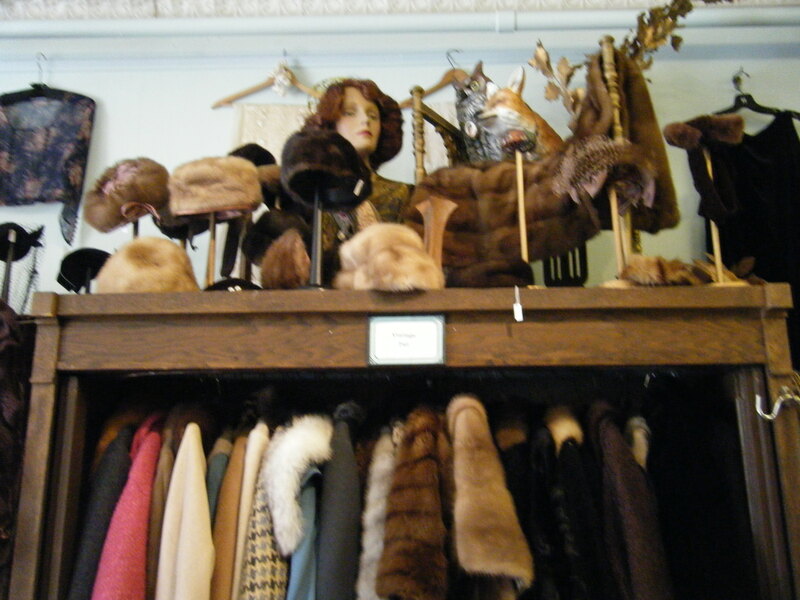 There are lots of other fun things for sale, including vintage repro jeans, adorable 1940’s shorts, ladies’ pants, a bevy of colorful dresses, men’s shirts, full skirts, wrap tops, ladylike blouses, and the infamous ski bunny knit top.